An insufferable amount of words have been written about how bad the Vernon Wells trade was from the Angels aspect. We get it. The contract is an albatross, Wells is a 32-year-old declining outfielder, his splits last year were a nightmare of Freddy Krueger proportions, Tony Reagins has a drinking problem, et cetera, et cetera... I know it hasn't been completely lost in the shuffle but the Angels also traded away the best hitter in this deal. The fallacy I keep hearing from Angels fans is that Mike Napoli wasn't one of Mike Scioscia's "guys" or he wasn't wanted in Anaheim or he wasn't going to get playing time anyway or the Angels didn't want to pay him the $6 million or so he was going to win in arbitration. Maybe, but by trading Napoli, the Angels made the Blue Jays better and themselves considerably worse. The Angels will go into 2011 with Jeff Mathis, a career .199/.265/.311* hitter, as their starting catcher. But this post isn't about how bad Mathis is, and he is bad, it's about how underrated Napoli is compared to Wells. 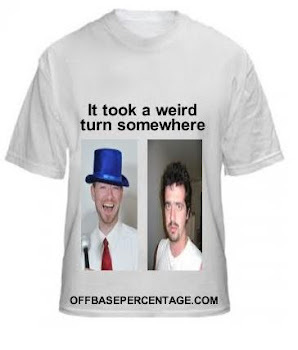 *I accidentally copied Mathis' OBP/SLG/OPS line first and thought we were all terribly misinformed. Then I realized I missed the actual AVG/OBP/SLG line and Mathis is worse than I ever imagined. I don't think the majority of people do realize that Napoli has been a better hitter than Wells over the past three or four seasons and will probably continue to be so over the duration of Wells' cashrific contract. For illustrative purposes, let's take a look at the career Weighted On Base Averages (wOBA) for Napoli and Wells. For those new to wOBA, you can read about it here. Click image to enlarge. 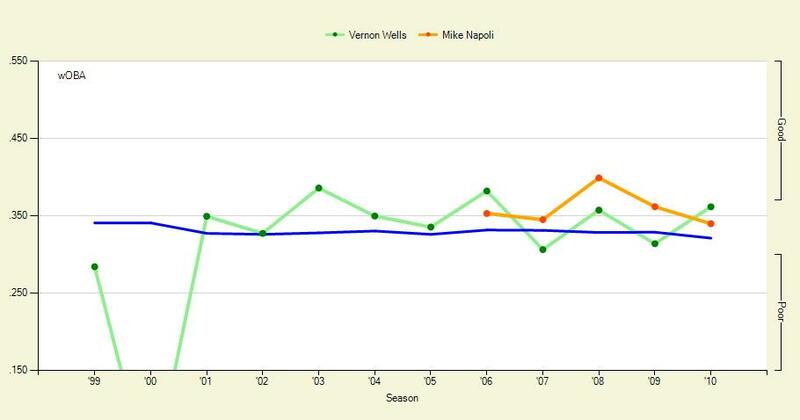 As you can see, Napoli has had a higher wOBA for each season since 2007 except for 2010. The Wells supporters like to point at the bounce back season of 2010 hoping it is an encouraging sign for things to come. Unfortunately, Wells' big 2010 season was aided by a massive power spike in Toronto. So I would caution any Angels fans who are hoping Wells will be bringing 30 home run power to Anaheim. Wells has as good a chance of repeating his 2010 season as I do being Scarlett Johansson's rebound. Obviously, I hope I'm wrong in both cases. The other concern about Wells is his splits. He hasn't hit lefties over the past two seasons and was atrocious on the road last year. Napoli isn't going to hit for a high average and he struggled with right handers this past season but absolutely crushes southpaws. He is also a pretty consistent hitter at home or on the road. I would love to be wrong about Wells but the numbers suggest he's on the decline and has lost the ability to hit left handed pitching. His spike last season was a clear product of the Rogers Center becoming a hitters park for 2010. I doubt this is one of those "change of scenery will do him good" scenarios. But who knows, maybe the Angels have the Fountain of Youth hidden in the outfield rocks. 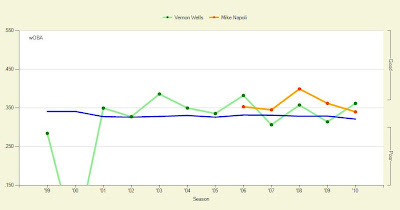 Napoli, on the other hand, is poised for a big 2011 season and won't cost the Jays the price of a small island. As an Angels fan, it isn't fun being the bearer of doom and gloom.